Indoor particle size distributions: implications for microbiology – microBEnet: the microbiology of the Built Environment network. Rachel Adams touched on this topic in a post last year, Size matters, or what I learned collaborating with environmental engineers, so I thought I’d revisit it. In her original post, Rachel described that she had been working on methods for air sampling for microbes and when she ran some ideas past her environmental engineering colleagues, the question of particle size arose. She was using “dust fall collectors,” or hanging petri dishes, to collect settled airborne particles and analyze for microbial communities. The engineers were concerned that by collecting airborne particles using settling dishes, larger particles that are more likely to settle out of the air onto surfaces may be over-sampled relative to smaller particles and dominate the mass captured on the petri dishes. As Rachel quickly learned, environmental engineers spend A LOT of time thinking about particle size. I want to continue that stereotype here, and think a little more about particle size distributions in indoor environments and describe what that means for particle fate, transport, and control. Much of this information is summarized beautifully by Bill Nazaroff in his 2004 paper Indoor particle dynamics. Let’s start with the impacts of particle size on fate, transport, and control, regardless of whether we’re talking about particles of biological relevance. Indoor concentrations of particles are impacted by a number of fundamental parameters, and many of them are size-dependent. For example, indoor particle emission rates are size-resolved. Whether you’re cooking (or baking, toasting, or frying), vacuuming, walking, burning candles, burning incense, smoking a cigarette, operating a 3D printer, or simply hanging around and shedding bacteria, particles of different sizes are being emitted with different abundance. So your activities govern both the amount of particles released into an indoor environment, as well as the size of those particles. And as Rachel mentioned, size matters…. Particle size matters because most particle removal mechanisms are also size-resolved. For example, when outdoor particles are migrating indoors with air infiltrating through cracks and gaps in the building envelope, both larger coarse (> ~2 µm) and smaller ultrafine (< ~100 nm) particles are more likely to be removed and deposited in the envelope than mid-sized accumulation mode (~0.1-5 µm) particles. “Penetration factors” — a number between 0 and 1 that describes how easily particles penetrate through a building envelope — will also vary depending on crack characteristics and air speeds, which may also vary depending on building airtightness or other construction details. We’ve come to understand this using models, lab scale measurements, and detailed field measurements, although we’re still exploring measurements across a wider range of particle sizes and home characteristics. I’m particularly interested in the variability in these size-resolved parameters from building to building. What limited evidence we have suggests rather large differences may exist between buildings. Regardless, particle size is extremely important for both indoor emitted particles and outdoor infiltrated. 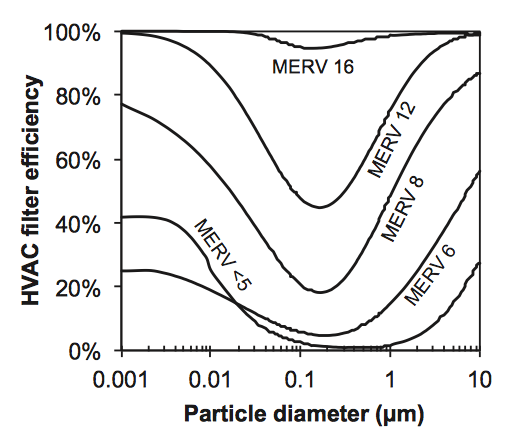 Obviously if the microbe you’re hunting for is 3 µm in size and you have a MERV 8 filter installed in an operating, recirculating HVAC system, the concentration or abundance will likely be lower than if you’re hunting for a smaller, say 0.8 µm, microbe because more particles of that size have been filtered out of the air. This is relevant for particles physically, as well as biologically. This is a very important consideration for airborne sampling, as different sampling techniques will have different collection efficiencies for different size particles. Which brings us to indoor deposition rates. 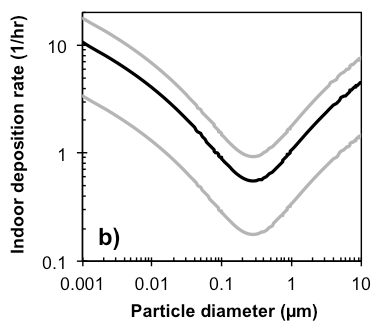 Indoor particle deposition rates follow the same general size-resolved trends as both filtration efficiency and particle penetration factors. This is because Brownian motion tends to govern the deposition of the smallest particles while gravitational settling tends to govern the deposition of the largest particles. 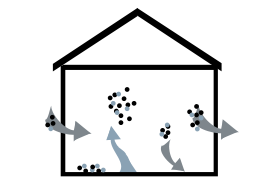 Accumulation mode particles in the middle size range (0.1 to 2 µm) exist in between these two and don’t deposit onto surfaces as rapidly. Once again, we know this from fundamental modeling, chamber experiments, and full-scale indoor measurements. As much as environmental engineers like to think of things in terms of particle size, we also really like to think in terms of orders of magnitude. As many as 2 or more orders of magnitude variation across particle sizes in one environment and 2 or more orders of magnitude variation across different indoor environments as well means that particle deposition rates are key parameters that need to be carefully characterized, particularly if you’re interested in using surface sampling to correlate back to what may have been in the air. Overall, we have excellent knowledge on the fundamental driving forces of these fundamental mechanisms affecting particle fate, transport, and control. However, we actually have surprisingly few measurements of many of these parameters in real indoor environments, which is something we’re continuing to work on here and others are doing elsewhere. By combining microbiology with aerosol science, environmental engineers, architectural engineers, and building scientists, we can continue to enhance our knowledge of the importance of size-resolution in indoor bioaerosol dynamics. Great post Brent. Thanks so much for doing that.